The argument that many are engaged in at the current time is whether or not the “male child” of Revelation 12:5, is Christ or the Church? The answer, the right answer, from powerful scholars throughout the ages is simply this: He is both. And the implications are astronomical! 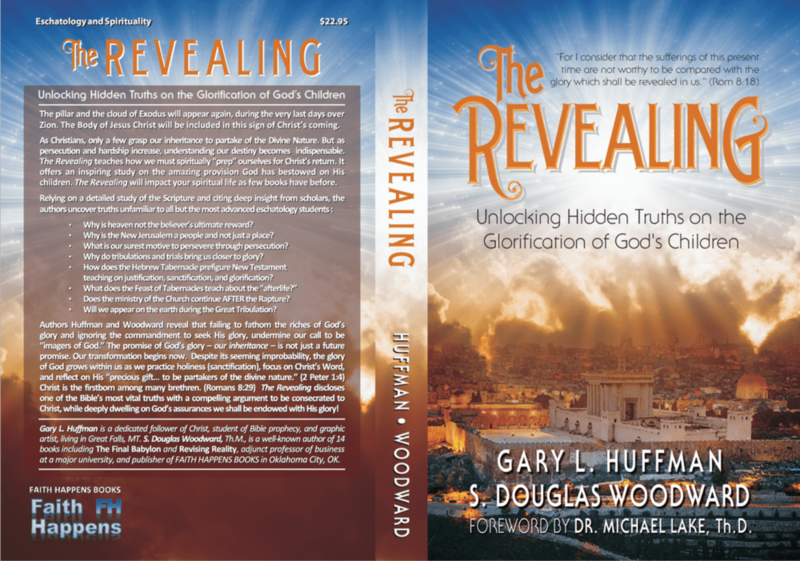 Because the male child is both, as Gary Huffman and I argue in THE REVEALING: UNLOCKING HIDDEN TRUTHS ON THE GLORIFICATION OF GOD’S CHILDREN, the “great sign” of Revelation 12 proclaims there is a rapture of the Church, and it happens at least 3.5 years (1260 days) before the visible return of Christ. In a separate post, I provided what I believe is incontrovertible evidence that the Bible teaches the two events (the Rapture of the Church and the visible, “Glorious Appearing” of Jesus Christ at the end of the age), are distinct events. Here is a link to the extensive chart I built to make this case plain. CLICK HERE —> Comparison 1 Thess 4 with Matt 24 9-1-2017 for the PDF. In this post, I want to provide evidence from several excellent sources, that the male child of Revelation 12 is both Christ and the Church – the united head and body in its mystical union. If so, the passage goes on to make plain that the male child is “plucked up” (harpazo, the same Greek word used in 1 Thessalonians 4:17) before the woman flees to the wilderness. (The woman is Israel – an interpretation seldom debated). Rev 12:1-6 1Now a great sign appeared in heaven: a woman clothed with the sun, with the moon under her feet, and on her head a garland of twelve stars. 2Then being with child, she cried out in labor and in pain to give birth. 3And another sign appeared in heaven: behold, a great, fiery red dragon having seven heads and ten horns, and seven diadems on his heads. 4His tail drew a third of the stars of heaven and threw them to the earth. And the dragon stood before the woman who was ready to give birth, to devour her Child as soon as it was born. 5She bore a male Child who was to rule all nations with a rod of iron. And her Child was caught up to God and His throne. 6And the woman fled into the wilderness, where she hath a place prepared of God, that they should feed her there a thousand two hundred and threescore days. Revelation 12:5 states that the child will rule the nations with a rod of iron. Surely then, the child is Jesus, for Psalm 2 testifies that the Messiah will rule with a rod of iron. 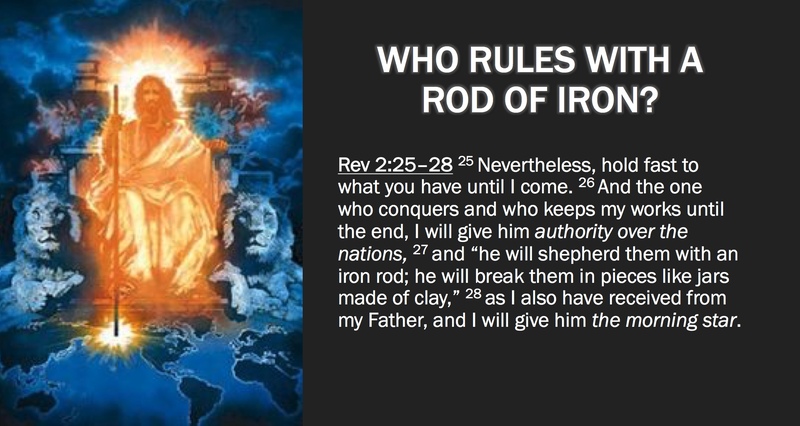 “Thou shalt break them with a rod of iron; thou shalt dash them in pieces like a potter’s vessel.” (Psalm 2:9) However, if we must make note that Revelation 2:27 has Jesus promising the Church at Thyatira they will rule the nations with a rod of iron – with Him. Therefore, we mustn’t jump to the conclusion the male child is just Jesus. When it is snatched up, at the Rapture, the Church and Christ are united – they become one. Thus, a full account of the Scripture demonstrates that the Church will reign and rule with Jesus Christ (2 Timothy 2:12) – and this includes the “rod of iron” descriptor. Consequently, we are left with a most definite impression that the male child who is plucked up to heaven is not Jesus Christ (who ascended visibly into the clouds as witnessed by the Apostles), but rather the Church of Jesus Christ who becomes fully one with Him. If so (and as we will see, many commentators insist this the male child comprises the Church and its “snatching up” comprises the Rapture), it begs the question whether the astronomical event (the arrangements of stars, planets, sun, and moon) which transpires on September 23, 2017, signifies the very moment when the rapture of the Church will occur. The “$64,000 question” about whether this means the Rapture truly occurs in two weeks less two days, I will leave for the end of this article. My point here: demonstrate the male child is unquestionably Christ, the Head, and His body the Church. THAT the rapture occurs separately from the woman fleeing to the wilderness, holds enormous consequences dictating vital events transpiring in the last days. WHO ELSE TAUGHT “CHRIST AND THE CHURCH COMBINED” COMPRISE THE MALE CHILD OF REVELATION 12? Gary at Unsealed.org, a terrific prophecy news website providing analysis and commentary, did all of us a wonderful favor. They assembled an amazing list of scholars that, unlike what good friends of eschatology, Jack Hibbs and Joel Richardson have stated, concur on the identity of the male child as both Christ and the Church united. This, clearly enough, is our Lord Jesus Christ, who is soon to reign over all the earth, and undoubtedly He is primarily the Man-child who is to rule the nations with a rod of iron, and the special object of Satan’s malignity. But we have already seen, in Rev. 2:26–28, that when He reigns He will not reign alone. . . . Is there then any incongruity in understanding the man-child to represent both Christ Jesus our Lord and His church? Surely not, for He is the Head of the body, the church, which is the fullness, or completion of Himself, so that the title, ‘The Church’ is applied to both head and body viewed as one in 1 Cor. 12:12. . . . We may then, on the authority of Scripture itself, safely affirm that the man-child represents the one New Man who is to rule the nations with a rod of iron—Christ, the Head, and the church, His body. For many, many years as I read verse five I recognized of course that the woman is Israel… the man-child is who? Jesus Christ. And her child was caught up unto God and to his throne. And I just took for granted that was an allusion to what? The ascension, right? It was G.H. Pember I believe, back probably in 1914, he was the first that I encountered at least, that saw this as possibly alluding to something else. Not the ascension, but the rapture. Her child, the Body of Christ, was caught up to God and his throne. That could be an allusion to the ascension, no problem. It also might be an allusion to the Body of Christ caught up in the rapture because the word ‘caught up’ there in the Greek is, guess what? Harpazo. Snatched. The same word that occurs in First Thessalonians chapter four. The article from Unsealed.Org lists a total of 25 scholars that agree on the identity of the male child. There should be no doubt that Revelation 12:5 is teaching the Rapture of the Church, that it is a separate event occurring before the woman flees into the wilderness, and before Satan and his angels are cast out of heaven. And she brought forth a man child…. Not Christ, literally and person­ally considered, or Christ in his human nature, as made of a woman, and born of a virgin, which was a fact that had been years ago; but Christ mystically, or Christ in his members, who are called by his name, because he is formed in them, and they are the seed of the woman, the church. Finally, allow me to quote from a recent paper of Dr. Michael Svigel of Dallas Theological Seminary, who has provided us with an extensive exegetical study, connecting Revelation 12 with Isaiah 66, among many other key matters. Attached here is a PDF of the 46-page paper by Dr. Svigel if the reader is eager to study this topic more thoroughly. John may intentionally have the neuter pronominal adjective ἄρσεν (instead of the masculine) irregularly modify the masculine υἱὸν. As observed above in the textual comparisons of Revelation 12 and Isaiah 66, the unusual grammar reflects the actual wording of the Isaiah text, where both the mention of ‘male’ and the corporate plural of ‘son’ (or ‘child’) occur in synonymous phrases expressing Jerusalem bearing in travail. That John has not made a careless grammatical blunder is clear from 12.13, where the masculine τὸν ἄρσενα is correctly used. On the other hand, some do not see a grammatical incongruity in the use of ἄρσεν, but view it as a noun in apposition to ‘son’, further describing it. . . . But this still leaves unanswered the question why the neuter occurs in 12.5 and the masculine in 12.13; in addition, the substantival use normally would be articular, as in 12.13. Thus, John’s use of “poor grammar” in Revelation 12:5 is intended to point the reader back to the images of Isaiah 66:7, which reads: “Before she travailed, she brought forth; before her pain came, she gave birth to a boy.” The next verse demonstrates that the woman and child are not intended to represent individuals, but rather assemblies: “Who has heard such a thing? Who has seen such things? Can a land be born in one day? Can a nation be brought forth all at once? As soon as Zion travailed, she also brought forth her sons (two sons? ).” The passage switches from the singular “son” to the plural “sons,” and describes the birth of “a land” and “a nation.” Therefore, given the symbolic parallels between the description of the woman of Revelation 12:1 and Israel of Genesis 37:9 as well as the intentional verbal allusion to Isaiah 66:7, where the woman is clearly the nation of Israel, “Zion,” the conclusion that best fits the evidence is that when the scene of Revelation 12 opens up, the woman primarily represents Israel of the Old Testament in travail. To take the male child, then, as only an individual man, Jesus of Nazareth, would be to break consistency within the symbols of Revelation 12:1-7. It is acknowledged that such an inconsistency is certainly the prerogative of the author, but it fails to come to grips with the fact that John is not composing the passage ex nihilo (i.e., without a context), but (is) describing a vision we believe actually occurred. Thus, the elements of the vision could be mixed; that is, the woman and the dragon could symbolize corporate entities while the male child is an actual human being. However, an interpretation that understands the male child to be a corporate entity does not contradict the context of the passage; it does, in fact, better suits the context. A further note. Whereas, Isaiah 66:7-8 is normally associated with the birth of Israel in a single day, it may more likely refer to the birth of a nation, “a peculiar people, a holy nation,” i.e., the Church (1 Peter 2:9) being born in a single day. The fact that the nation is born before the woman (Israel) experienced birth pangs (perhaps meaning the Great Tribulation, the Time of Jacob’s Trouble?) certainly increases the likelihood that the Holy Spirit was inspiring the authors to “encode” the mystery of the Church and its destination within these passages, and their linkage as Dr. Svigel points out through his exegesis. Recently, I wrote an article for the September issue of Prophecy in the News Magazine. Attached is the longer version of the article for your review here. The article takes up the subject of whether or not September 23, 2017, at the conclusion of Rosh Hashanah (The Feast of Trumpets), will culminate in the actual Rapture of the Church. 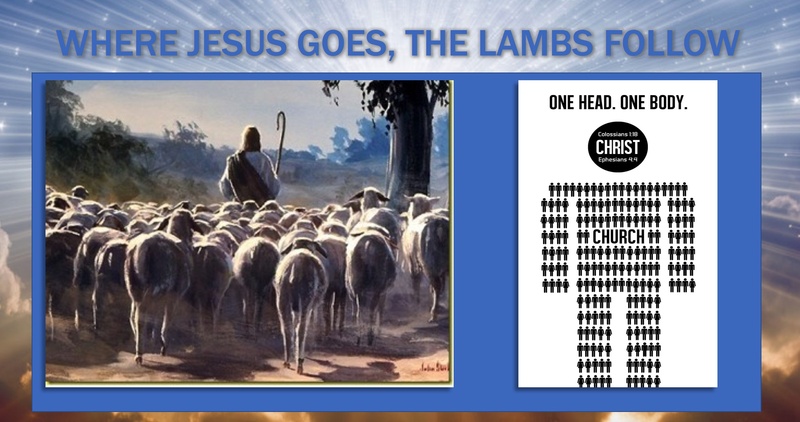 I encourage readers to take the time to read that article, for in it I explain why the Rapture could happen in 12 short days, but, certainly has brought forth a teaching from the stars that has been, for the most part, lost to the present day evangelical church. That is, Revelation 12 teaches us the Rapture is a distinct and imminent event. We will be caught up into the clouds BEFORE the woman flees into the wilderness at which time there is 1,260 days before the LORD returns visibly to the world. And as Gary Huffman and I write in The Revealing, before the Church takes on its new duties to administrate God’s cosmos, replacing the “powers and principalities” that occupy the second (and possibly the third) heaven today, the Rapture must happen FIRST. This truth, given all the debate about when the rapture occurs, is one that we need to hear, acknowledge, and incorporate into our beliefs about the last days. For, and this is the crucial point, if the male child is the Church, the rapture will occur before the Glorious Appearing, perhaps 3.5 years, perhaps 7 years, perhaps longer. But it will not happen at the same moment as Post-Trib believers assert (well meaning though they be). Here’s our article. Enjoy. Please share this article with your friends and family. For there is a crown awaiting all those who eagerly await the coming of the LORD. Note the King James Version capitalizes Child, presuming the child is divine. The seventeenth-century translators therefore presumed (mistakenly I believe) that Jesus is the “exclusive” male child in Revelation 12. PLEASE SIGN UP FOR ARTICLES LIKE THESE AT MY WEBSITE, WWW.DOOMSDAYDOUG.COM. The newsletter/article signup field is located in the right-hand column at the bottom of the web page. Remeber, because of censorship I will soon lose the opportunity to publicize my writings through Facebook, Twitter, and other social media. So if you want to stay in touch, please sign up right away! Check out my author page to buy my books (and support my ministry!) It is here: CLICK.